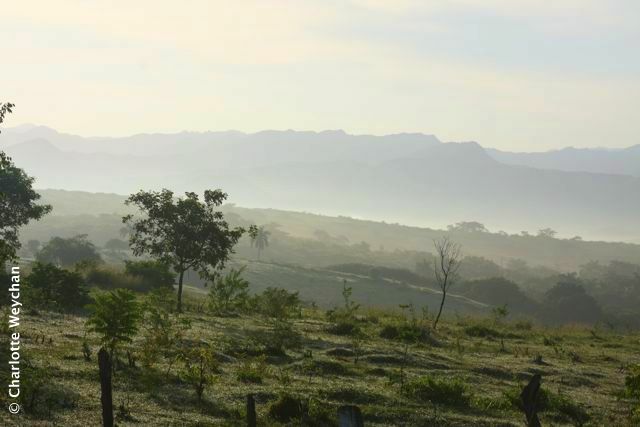 It's been well over a week since I last posted because it's difficult finding a good internet connection in Cuba! But it's a wonderful country and now I'm home in the UK, I shall be catching up on all the wonderful gardens and greenery I saw on my recent trip. After four wonderful days in Havana, where I soaked up the sights of the city and made time to visit the Botanical Garden, we left for the countryside and headed east towards the coast and the stunning countryside around Santa Clara and then on to the south coast, where we stopped at Cienfuegos, which has its own remarkable Botanical Garden (above). Cuba's hot right now, just like Florida, with temperatures well into the 90's, so the best time of day to be out and about is early in the morning, to catch the morning mists (above) and enjoy the wonderful landscapes. The Botanical Garden at Cienfuegos was right at the top of my list of places to visit because of its long-term connection with Harvard University throughout the first half of 20th century, and its formidable collection of trees and tropical plants. There are well over 200 species of palm here, and the garden covers some 75 hectares. 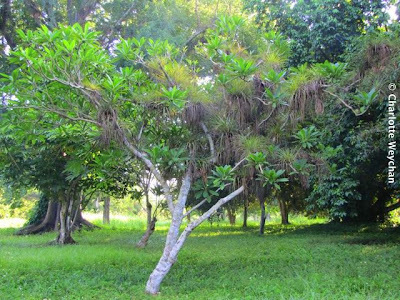 It became a center for tropical plant research back in the early 1900's, and had strong links with Harvard University during the first half of the 20th century, as a result of a meeting between Edwin Atkins - an American sugar planter in Cuba - and Harvard professors, Oakes Ames and George Goodale. These three men established the Atkins Institution in Cienfuegos to carry out research on sugar and other commercial crops, and by 1920 the garden became officially affiliated to Harvard, following a large endowment from Edwin Atkins. By the mid 1930's the garden had become internationally recognised as an important research centre, and regularly received visitors from overseas who were interested in tropical botany. 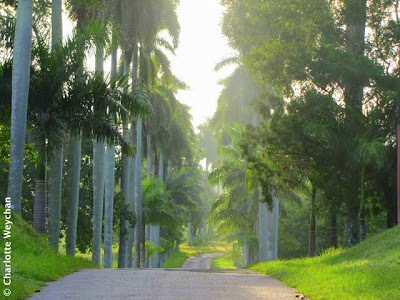 But links with the US were severed after the Revolution in Cuba, although the garden remains open today, primarily as an arboretum with its many magnificent specimen trees, and continues to draw visitors from all over the world. It also has a fine collection of cacti and succulents indoors. I've never seen the Carrion flower (above) before, or indeed smelled anything quite like it! Also known as stapelia gigantea it is reminiscent of unwashed socks, and is mostly found in India and Africa, but also grows in the glasshouses at Cienfuegos ... quite an eye opener. 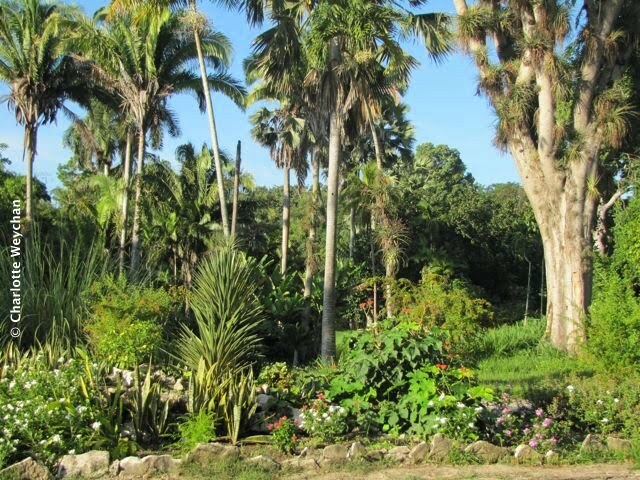 Today, the garden is run by the Cuban government and is a really fine showcase for what grows in the tropics - but remember to put on your mosquito repellent if you visit, because I got eaten alive! I would like to visit Cuba's gardens and enjoyed reading a bit of history about Cienfuegos, the American sugar planter and Harvard. Gorgeous photos. What a vacation that would be. The carrion flower looks like it belongs on the bottom of the ocean. What fun to visit Cuba! I love your photos. The green in the first shot is amazing ... the photograph is so mesmerizing. I love it! Thank you for that wonderful post! I had no idea the Botanic Gardens at Cienfuegos used to be affiliated with Harvard. It is odd to see how an institution can largely ignore and forget such an interesting part of its history simply because it might have politically inconvenient associations. 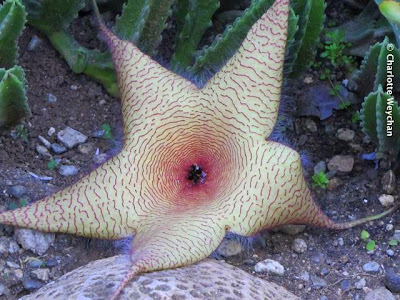 The Carrion flower looks like a combination of octupus, sting-ray, and starfish. Amazing! 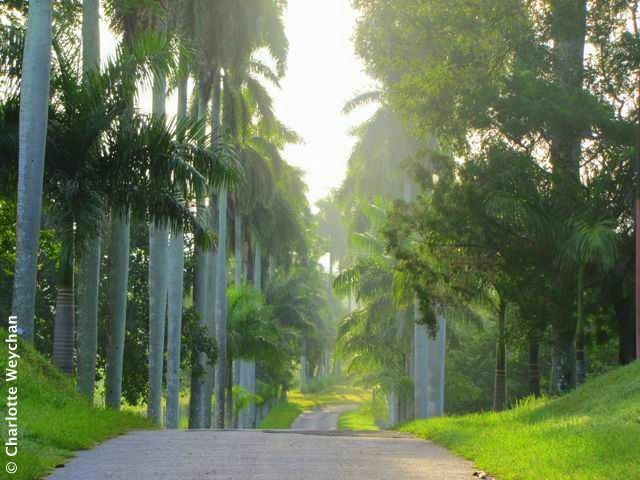 I must say Cuba has some natural Green beauty abt it. Didn't know that octopus of a flower is also found in India. Whoa! Some picture n thx for sharing your Cube adventure with us here. Hope u have a Great Trip.